New Era Finally Catering To Armchair Athletes | OhGizmo! New Era has definitely found a profitable market when it comes to sports fans or urban fashion, but it’s hard to ignore the ridiculous amounts of money being spent on video games every year. So the company is introducing a series of classic-gaming themed caps that I’m sure I’ll be seeing on the heads of hipsters all around town. The Pacman series features Pacman himself, a red cherry or 3 ghosts while the Space Invaders series includes the iconic aliens. Hey! I check this site every day and it’s pretty much an honor to be linked. Thanks, dudes! The Pacman series and Space Invaders caps are great but I wonder if they'll release versions for modern day games, world of warcraft etc, these games have a huge following after all! 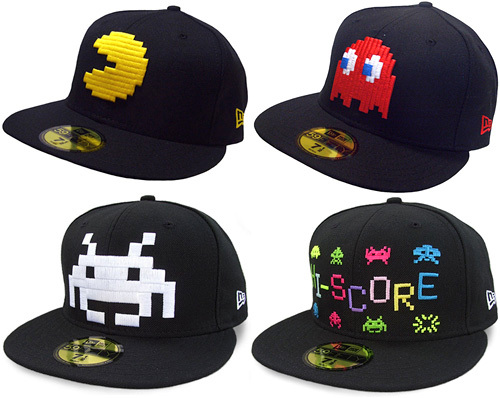 amazing,it will add to my collections of caps.i love the new design since my favorite game is pacman.i have to hurry to buy all the staff. Salut les gars! Ceci est mon new era hats site web par moi-même, et je confus qui est-il bon ou non par WordPress ou Joomla, je veux choisir un 4 moi, et me donner quelques advice.Thank vous! I hope this will allow, I've never used this site before, so not really sure what he did. So this is just anew era capsmessage. I really like this forum has several excellent discussions that take place.